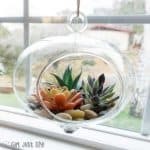 Faux Succulent Planter - Easy DIY Decor - Girl, Just DIY! 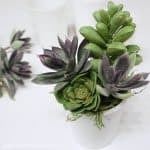 So you love the look of houseplants, but your green thumb is actually closer to shades of black? Or you don’t have the right sunlight in your house to keep them healthy? 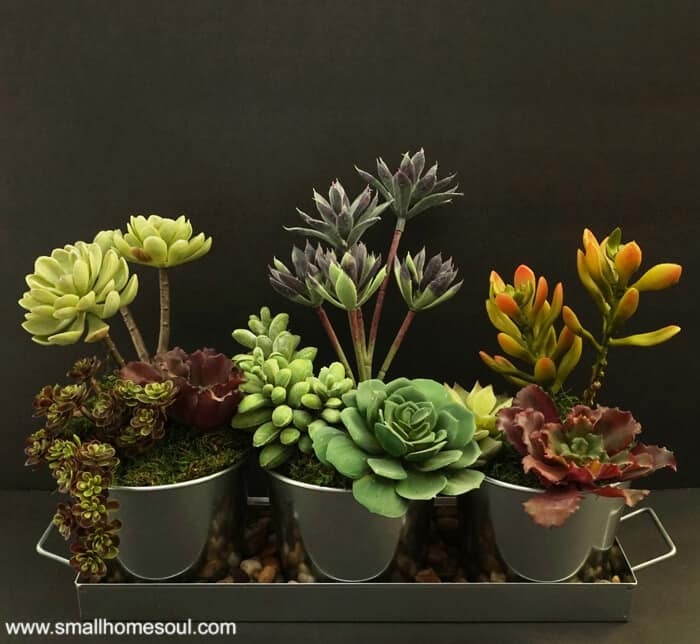 Then you might need to introduce a Faux Succulent Planter into your decor to enjoy having greenery in your house. There are plants that I’m really good with but I really prefer the ones that need less attention from the start, like succulents. 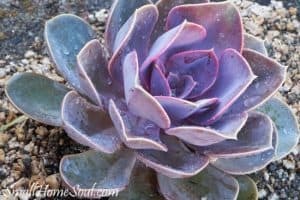 I love them so much last summer I shared How to Plant a Succulent Garden. 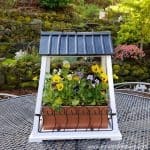 This is a similarly easy project you can use any container you like. You can even make one for a friend who might love houseplants but who also might make them suffer a slow death. Recently I got to work with a great company called Afloral.com who has sponsored this post by providing materials in exchange for this post. All opinions shared here are always mine and are not influenced in any way. I am happy to report that bot only does Afloral have silk and faux flowers, but they also have non-floral decor items as well as all the supplies you want/need to make your own beautiful projects. And their prices are super reasonable. Like I said I love houseplants; my mom had our house filled with them for as long as I can remember. She still pretty much lives in a houseplant jungle. Even with all that experience as a kid transplanting and watering you’d think I was a pro. Somewhere along the way my brain shut off and I forget to water them. Because I love succulents, and these needed no love, I knew immediately that’s what I wanted for my project. So I ordered all beautiful faux succulents and some desert foam for arranging. I must say these faux succulents look and feel very realistic. They’re heavy, very good quality, and they require no dirt. Dirt that dries out and becomes a home for a bug colony, seriously it happened! 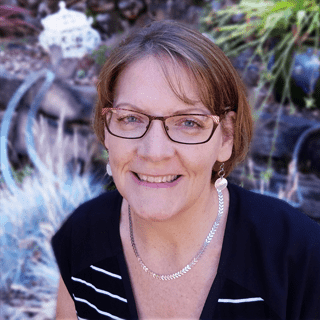 You won’t believe it…. Originally I had in mind to put the succulents into a wine barrel ring shaped into a heart that I got at a flea market last year. I prepped that several days ago but as I was preparing to assemble the faux succulent planter I wasn’t thrilled. 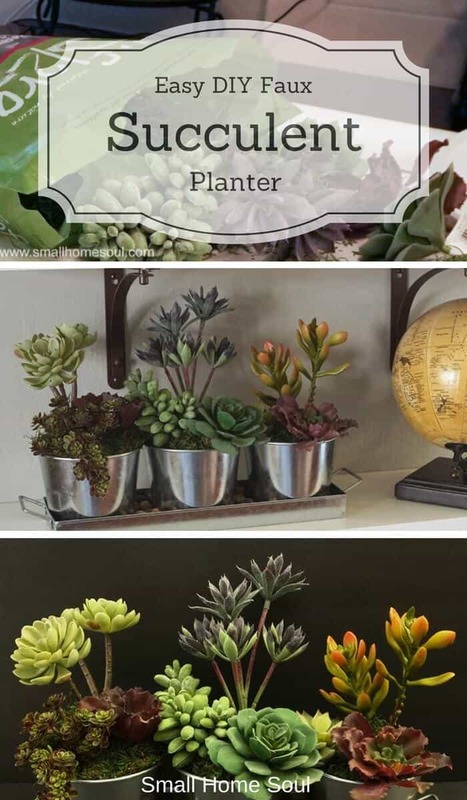 I still might do it but with real succulents outside in the garden. After that idea went south I tried to make a terrarium in a beautiful lidded glass container, but the moss made it look like an Easter basket. Strike two. Time was running out because if you haven’t figured it out by now I’m a bit of a procrastinator. 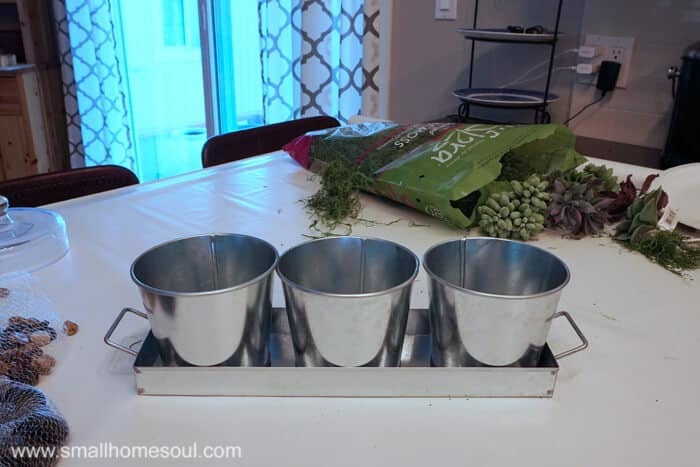 This post had a due date and here I was 2 days before the due date with a few non-starter projects, a counter top strewn with faux succulents and spanish moss dust, and no plan. Panicking just a bit, like when I discovered the bug colony, I scanning my living room for a container and quickly spied the galvanized planter set on the Livingroom Shelves that had two random fakes dropped in. Perfection, I was back in business. Now that I had a plan I cut down some pieces of the dessert foam with a serrated knife and stuffed them into the pots so they fit snugly. Everything looks better in odd numbers so I started playing around with height and color using 3 different succulents in each of the 3 galvanized pots until I had them just how I wanted. 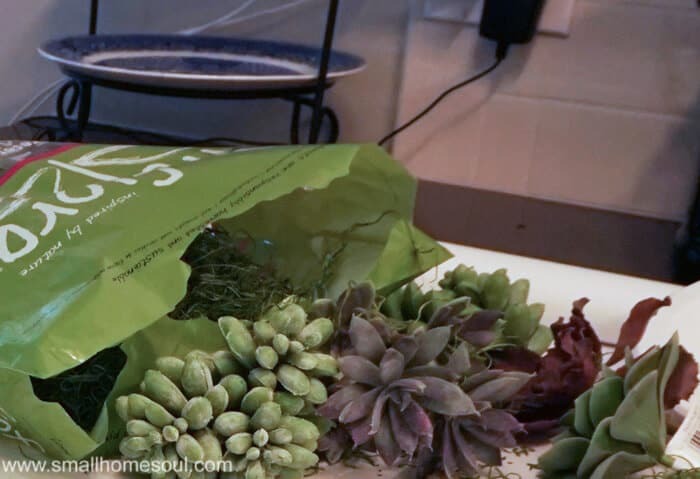 Most of the faux succulent stems cut easily with scissors. A few of the taller ones required some wire cutters to get through the wire in the stem. I worked to balance the colors and height nicely until it was pleasing to my eye. After I got it right I pushed the stems into the desert foam. No glue was needed but depending on your design you might need a glue gun to secure them. I was getting close but it needed some finishing touches. Into the pots I stuffed some wadded up packing material to fill the void and then topped it all off with Spanish Moss. But wait, there’s more. I poured some pebbles into the galvanized tray to give the appearance that the pots were sitting on the bed of pebbles. Ahh, I think you’ll agree that it turned out just lovely. And guess what? They’ll never wilt, wither, or die 😉 Oh, and they’ll never become home to a colony of ants in the entry way by the old tired windows. You see, I had forgotten to water a plant for so long that an ant colony marched themselves single file through a crack in the old window frame, up the side of the pot, and took up residence in a heart hoya plant. Do you really want to know what happens when you water an ant colony? I’ll just pause here a minute and let you picture what that might look like. You know that eye-popping emoji? That was me as I swooped up the pot and carried it out to the lawn. Then I hopped around wiping ants off my arm and hands for what seemed like hours (ok minutes). My faux succulent planter is beautiful; these are some of the best fakes I’ve ever seen. I’m trying to be artsy with the black backdrop. I learned this trick from my friend Sarah at 1915 House when she made her yummy Krinkle cookies at Christmas. My pics turned out pretty awesome considering I’m far from a pro with a camera. I bet the pros don’t stand behind their camera with a dark bedsheet to block the light from the window 🙂 Or maybe they hire people like me to do that for them? Here’s my new faux succulent planter in its new home. 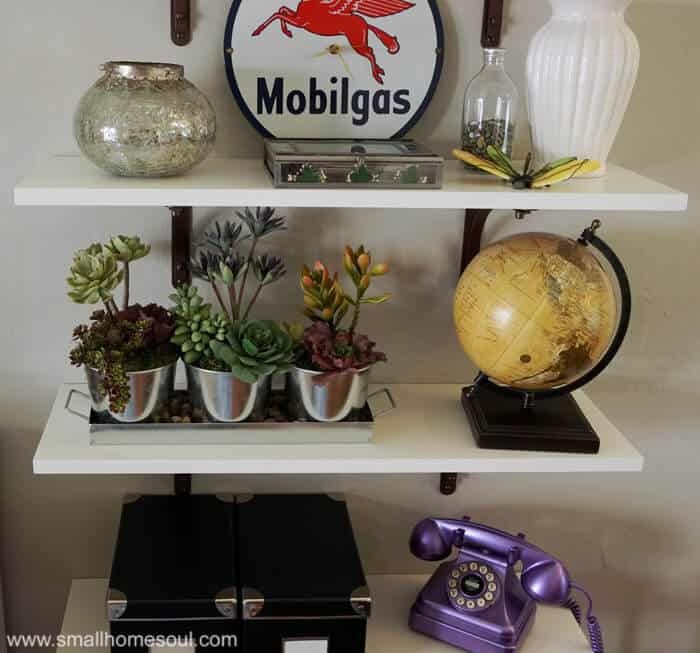 I love the galvanized pots and the height and color of the succulents were just what the shelf was missing. And not an ant in sight. I love these!!! They are perfect for someone like myself who was born with a black thumb. Haha Ashley that’s so true, they will always look healthy and pretty. Beautiful job, Toni. You could sell a boatload of those! Thanks Susie, that’s a great idea!! Love this! And you’re right…. your photos with the black background are awesome! Very pretty and I love the way you’ve arranged them! Thank you, I am so happy with the balance of the arrangement! 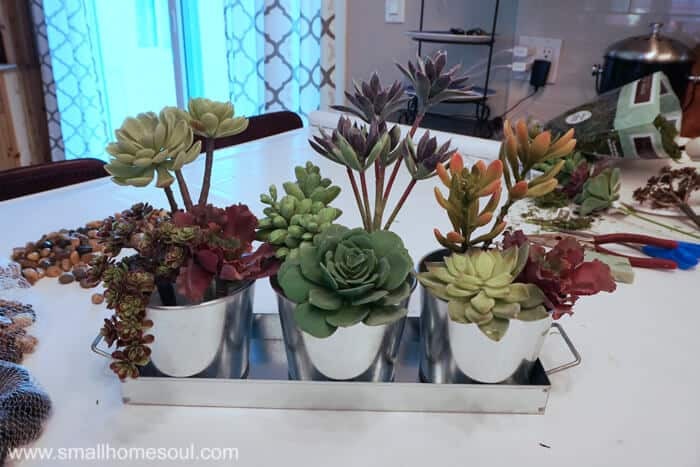 I love that the faux succulents are very “real” looking….this is so beautiful!!! Pinning too! Thanks Kathleen, I’ve had those post for over a year so I was glad to finally use them for something pretty! Such a great idea! I love the look of this. Pinning! Thank you Jennifer, I’m thrilled with how it turned out! 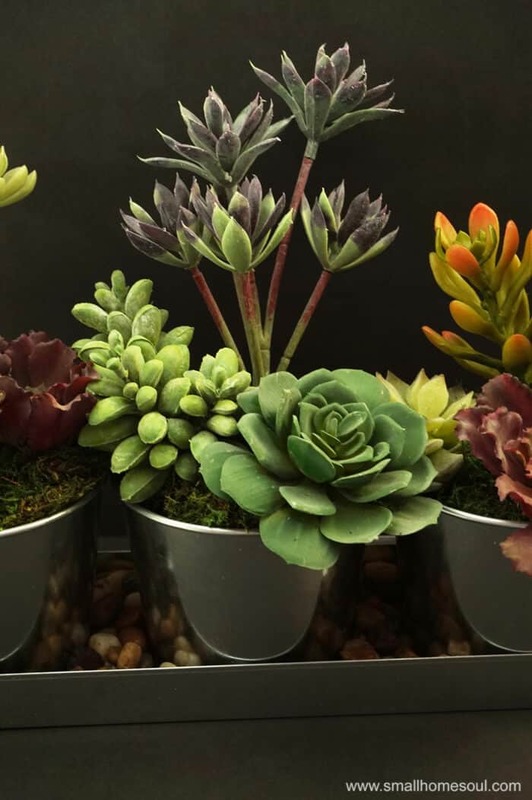 These are great-looking faux succulents. They don’t look “plastic”. I can never get succulents to live, so I might try some faux ones. Also – I like the slightly industrial look of the galvanized metal and the pebbles. 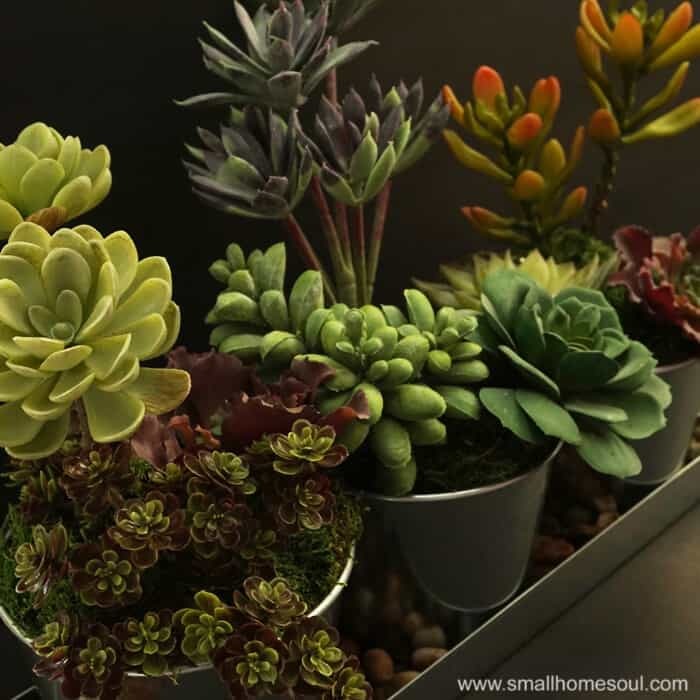 Nice contrast to the soft green colors and curved shapes of the faux succulents. Thanks Carol, these are really good fakes and they feel close to the real things as well. I got those galvanized pots at our local grocery store after summer on clearance. It adds a little shine to the shelves. Very clever Toni! Love them on your awesome shelves with all of your other fabulous goodies! Thank you Sam, I can’t believe I lived with blank walls for so long before I got the shelves put up. I just love how they are spilling out! Thanks Jes, I loved that they had some succulents that did that! This is a great idea. 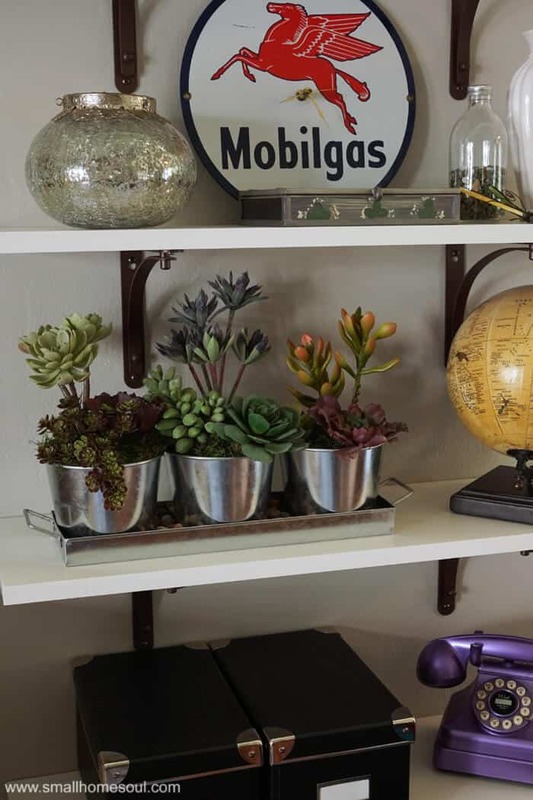 I love how you styled the plants on the shelf, along with the Mobilgas sign. Way back when my uncle owned a Mobil Gas Station so it brought back some memories. Toni that is so classy! I love it! And it looks perfect in its new home! Thanks Janice, that means so much to me!